Wendy's 3-D Cats: DYLAN DOES MEW YEAR! Dylan is finally getting into the act, after a hard night of partying! 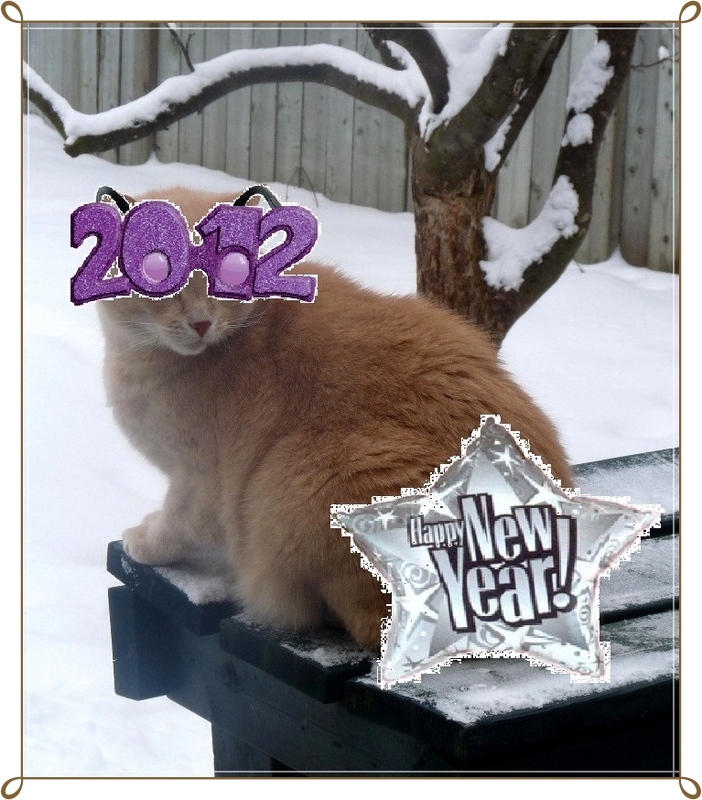 He's wishing efurryone a very Happy Mew Year for 2012, but most of all he wishes he could get out of the cold. He's already turned into an EYEsicle as you can see. "I wishus efurryone a wunnerful yeer to come, and all da tuna melts dey kin eat! Aftah piggin' out on cold cuts all nite, I needs sumfin to warm me up, doan yoo?" Looking good pal! Happy New Year and I hope 2012 brings you all the furry best! Dear friends we wish you a wonderful 2012 filled with health and happiness!!! Stay warm this New Year! Dylan, you are one sweet eyecicle! Happy New Year! Here's to a reasonably healthy and happy 2012--remember to take joy in the everyday things. Maybe a saucer of warm nipnog? Yum! I could use a nice, toasty tuna melt to start off 2012! In fact, my human says she wouldn't mind one either! Watch out that you don't freeze your goodies, Dylan! Happy New Year, dear furriends! Time to get out of the cold and in front of a toasty fire or on a nice warm lap. HAPPY MEW YEAR TO YOU TOO!!! All the best to yous and yours from us and ours!